Version 3.2 of BMM Explorer is now available. automatic identification of back-of-blast on a blast perimeter. The automation of these functions, essential to the accurate measurement of blast movement, reduce the time to process BMM vector data. 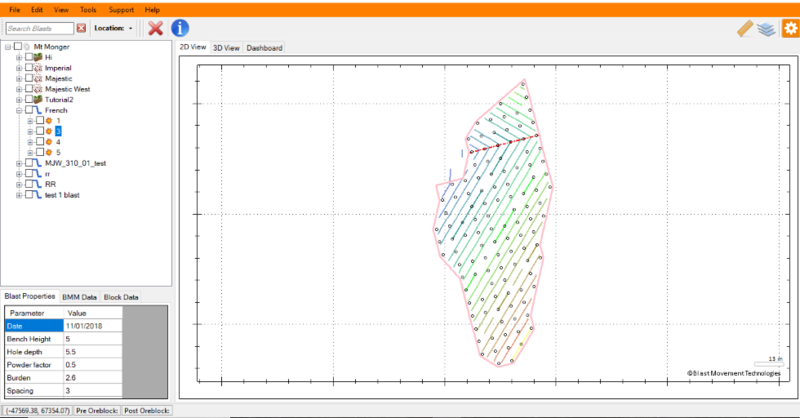 After the user imports blast holes and initiation data, BMM Explorer automatically identifies the blast perimeter, then calculates the direction of movement and centreline. Customers can download the new version, which provides an English, French, Spanish and Russian GUI, from the support centre. BMM Explorer automatically calculates the centreline in a blast.